How long did the Israelites sojourn in Egypt? | Could Joseph and Imhotep have been the same person? The New Testament also refers to this 430 years. Because of this many scholars believe that the 430yrs commenced with the promise being given to Abraham 215yrs before Jacob and his family moved to Egypt. The result of this is that some scholars believe that Jacob moved to Egypt only 215 years before Moses lead the Israelites out of Egypt (The Short Sojourn). Other scholars believe that the Jacob’s family numbering about 70, move to Egypt 430 years before the Exodus (The Long Sojourn). When Jacob and his family went to Egypt, the Israelites numbered about 70. When they left Egypt they numbered around 2 million. They needed time time multipy to this number. Not withstanding this, it is obviously important to know whether the Isralites were in Egypt for 430 years or 215 years so that we know in which dynasty to look for Joseph. The place where Abraham received the promise was Cannan. This is where Jacob was born and returned to before moving to Egypt. In Genesis 15:12-16 & Acts 7:6-7 it is clear that the foreign land where the Israelites would serve as slaves for 400 years did not include Caanan. From the accounts of Exodus 6:13-26 and Exodus 12:31-42 it is likely that the Israelites lived in Egypt for 430 years to the day. The Israelite oppression only lasted 400 years Genesis 15:12-16 . The Israelite Oppression ended when the 12th dynasty ended. The Exodus did not take place until 30 years later when Neferhotep I was ruling towards the end of the 13th dynasty. Mudbricks in the Amenemhet III pyramid in Hawara. This was the last great pyramid to be built. If it is true that Joseph and Imhotep were the same person, then the first pyramid (the Step Pyramid in Saqqara) was designed by an Israelite at the beginning of Israel’s Sojourn in Egypt. What’s more, if the last of the great pyramids (those of the 12th dynasty) were constructed with a core made from mudbricks which were made by Israelite slave labour, then the Israelites were in Egypt while all of the great pyramids were being constructed. When the Israelites departed from Egypt in the 13th dynasty, lead by Moses, there were not enough slaves in Egypt to make construct pyramids any more. Thus the pyramid age coincides with Israel’s sojourn in Egypt. The pyramids were thus constructed over a period of around 400 years. 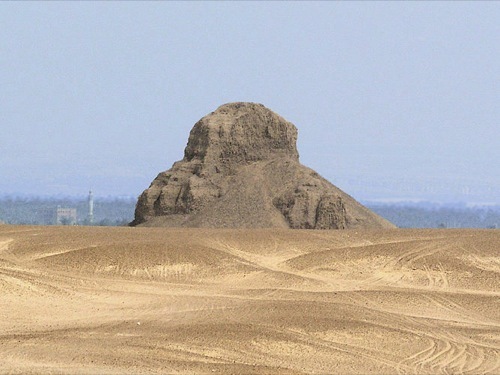 The Black Pyramid of Amenemhet III. 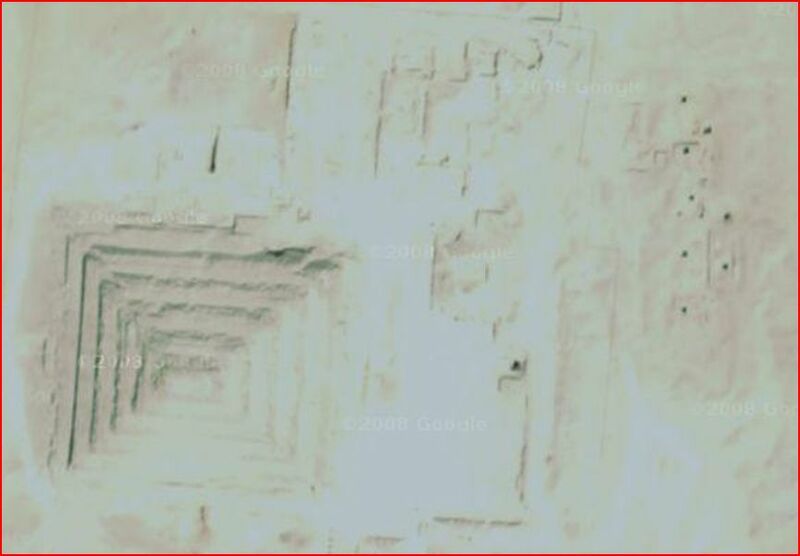 The inner core made of mud bricks is exposed. Josephus records that the Israelite slaves were given the task of building the Pyramids. The Pyramids of the 12th dynasty had an inner core that was made of mud bricks. Egypt’s wealth and power reached it’s peak in the 12th dynasty under Sesostris III and his son Amenemhet III but as they had no successors, the Middle Kingdom started to fall apart when they died. Moses, an Israelite baby, was adopted by the Princess Sobekneferu and groomed to be the next Pharaoh (Amenemhet IV). Amenemhet IV did in fact co-reign with Amenemhet III for a period of 9 yrs but when he had to flee to Midian at the age of 40 years, there was suddenly no successor for Amenemhet III. His daughter Sobekneferu had to take over the reigns when Amenemhet III died. She only lived for another 4 yrs and when she died, the 12th dynasty ended, Egypt fell into turmoil and became politically unstable. There was a quick succession of Pharaohs in the 13th dynasty until Neferhotep who was the Pharaoh who was ruling when Moses (Amenemhet IV) returned from exile in Midian. After a series of ten plagues that were inflicted on Egypt, Neferhotep let Moses take the Israelities into the desert. When they did not return, he pursued them with his army. The Israelites were able to cross the red sea at the Gulf of Aqaba but Neferhotep and his army drowned when they tried to follow. Moses and the Israelites Crossed the Red Sea at Nuweiba in the Gulf of Aqaba in 1446BC. Not only did Egypt lose its slave labour force, it lost it’s monarch, it’s entire army and it’s transportation system. It was a massive defeat and not something that Egyptian historians would want to memorialize. When the Israelites left Egypt, Pharaoh and his son died and all the Egyptian army drowned in the Red Sea taking all of Egypts chariots with them. Egypt was then thrown into turmoil. Thy Hyksos were able to take power and Egypts second intermediate period followed (until the Hyksos were finally defeated in the 18th dynasty). The Israelites, therefore, had a profound influence on Egypt. Joseph saved Egypt from 7 yr famine, brought up all the land of Egypt and made the Pharaohs wealthy. Joseph designed the first pyramid (in the third dynasty), was the first to build with columns, write on papyrus and practice medicine and preservation methods. Later in their sojourn, the Israelites provided slave labour for various public works which included making mudbricks for the construction of the last of the great pyramids (those of the 12th dynasty).The Israelite Sojourn, therefore, coincides the Pyramid Age. 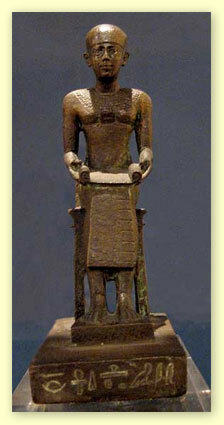 Egypt was destabilised when Moses (Amenemhet IV) went into exile as there was nobody to continue the 12th dynasty. Egypt suffered massive losses as a result of the Exodus 40yrs later (1446BC) and as a result became vulnerable to invasion. The Hyksos took over and ruled Egypt for the next 400 yrs (the second intermediate period). The Israelites had a lot to do with the building of the Pyramids. While they were not directly involved with the building of all the pyramids, the pyramids were all constructed during the time of Israels sojourn in Egypt. The first pyramid was designed by an Israelite; namely Joseph (Imhotep). The pyramids of the 12th and 13th dyndasties were constructed using Israelite slave labor. When the Israelites left Egypt (the exodus), no more pyramids were made. The Pyramid Age, therefore, coincides nicely with Israel’s Sojourn in Egypt.